Here at Dish, we are always experimenting, trying new recipes, combining tastes and ideas to create new and tasty menus. And this is one of our new favourite recipes…. The recipe for this sumptuous and highly addictive Peanut Butter Ice cream is out of one of my all time favourite cookbooks “Duck and Waffle” by Daniel Doherty , and it is a compilation of recipes and dishes at the infamous 24/7 London Restaurant “Duck and Waffle” . 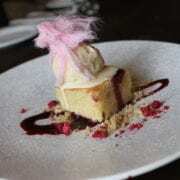 We are well and truly addicted to this ice cream and wanted to share the recipe with you! 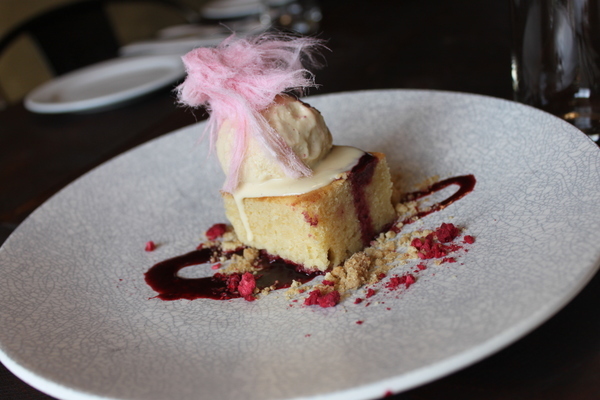 Here we have combined it with a rich White Chocolate mud cake, Berry Coulis and Fairy Floss. You could also make it into an Ice-cream sundae for the kids topped with caramelised nuts such as hazelnuts, almonds or peanuts, drizzled with chocolate sauce and topped off with a healthy dollop of whipped cream! Yum!! Once the milk and cream comes to the boil, pour half in to the yolk mix and whisk together. Pour this back into the remaining milk and cream in the saucepan and heat until gently thickened. You can use a thermometer to check this. (84°C is the correct temperature – any higher and the eggs will scramble and the ice-cream will be lumpy) Alternatively if you don’t have a thermometer, cook until the mixture coats the back of a wooden spoon and stays there without running off straight away. Strain the mixture and transfer to another bowl to stop it cooking, then cool and churn. If you don’t have an ice-cream machine, freeze the mixture in four batches and once frozen, blend in a food processor. Return to the freezer after blending.